ICH Blog: Hobby Horse Making Workshops - What is a hobby horse, anyway? Hobby Horse Making Workshops - What is a hobby horse, anyway? When most people today think of a hobby horse, they think of the child's toy - a horse's head on a stick. But in Newfoundland, the hobby horse was, and is, part of a very different Christmas tradition, part of the holiday season house-visiting tradition. Far from the harmless child's toy, Newfoundland Hobby Horses were something a bit more frightening. A horse's head, with wandering bottle cap eyes and nails for teeth, the janney’s ‘hobby horse’ or ‘horsey-hops’ is an odd creature. Most hobby horses had jaws that would "snock" together loudly as it bumbled around, snapping at other visitors and frightening children. Not every community in the province had the hobby horse, and many Newfoundlanders and Labradorians have never heard of the practise. 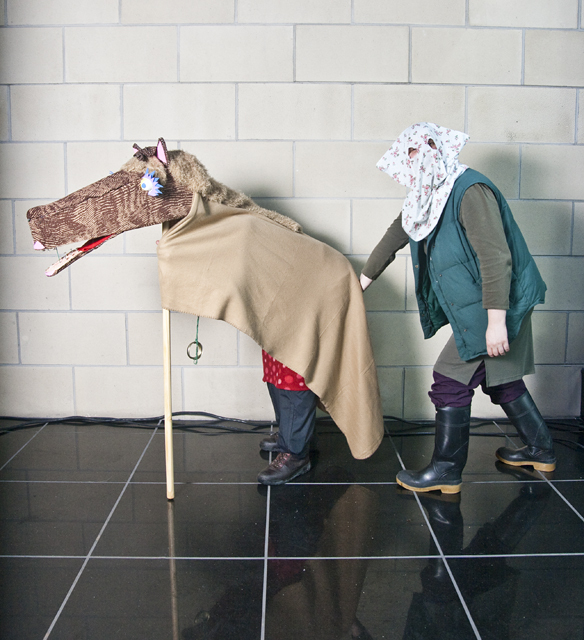 Read Andrea O'Brien's article on the Hobby Horse tradition here. As part of the annual Mummers Festival, there will be a series of hobby horse building workshops. People can come, learn how to build a hobby horse, and then gallop to the Mummers Parade on December 18th. The workshops were one of my favourite parts of the festival last year, and I'm glad that they are back. R.A. Templeton Ltd., a long-time Newfoundland paint distributor, is one of the materials sponsors this year, along with the Heritage Foundation of Newfoundland and Labrador, and the City of St. John's. This allows the workshops to be kept free, but participants are invited to bring along any of the suggested materials on the workshop webpage to help offset our costs. Material and cash donations are welcome (you can email me at ich@heritagefoundation.ca if you have materials to donate). Details of the workshops can be found here including info on times, location, and parking. Can't make it, but still want to create a hobby horse? Read Ryan Davis's 2009 DIY article in The Scope, or download the template to make your own horse's head.